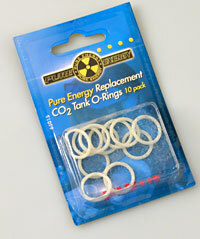 These replacement neophrene paintball C02 tank sealing O rings fit all standard paintball tanks. These can fail after only a couple tank recharges, so it is a good idea to always have a couple spares on hand. Sold in packs of 10.